(Pooler, G.A.) 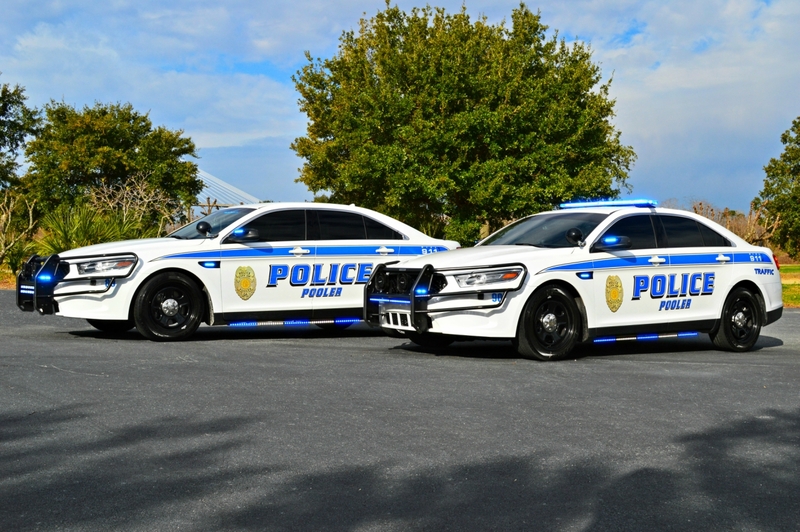 – The Pooler Police Department recently introduced a pair of Ford Interceptors to its Traffic Unit. The 60 person agency, which is located near the Georgia/South Carolina border incorporates a heavily travelled portion of I-95 in its jurisdiction. Until recently, the department strictly operated a fleet of Ford Utility Police Pursuit Vehicles but needed a more versatile option that would be able to reach high speeds quickly while being nimble enough to perform quick turns in and out of interstate medians. These cruisers which will be joined shortly by another pair of Ford sedans, will bring the units total to 4. The Pooler Police Department has a long history of running Fords and selected the Ford Interceptor over other police pursuit rated vehicles to maintain fleet consistency. These new additions to the fleet feature a full Whelen emergency lighting package that was upfit locally by West Chatham Savannah. To ensure officer safety, the vehicles are equipped with a full dual color 360 degree lighting package which includes Whelen Tracers, Legacy Lightbar, Inner Edge Visor, Mirror Beams and Dominators. Under Georgia state law ocga 40-1-7, only one vehicle per agency that is used routinely or primarily assigned to traffic duties is permitted to be a slicktop. As such, each of these new units feature roof mounted LEDs. The cruisers also prominently display the agency’s bold graphics package and a “Traffic” decal to make these units easily identifiable to the general public. We’d like to extend a very big THANK YOU to the Pooler Police Department for allowing us to photograph their new units. To view additional images of these cruisers please visit the “Out of State” portion of the database.